I have been a freelance artist & illustrator for over twenty years working for many publishers including the Medici Society, Woodmansterne, UK Greetings and Nigel Quiney. In 2007 I graduated with distinction from the Society of Botanical Artists diploma course and am now concentrating on more botanical subjects. 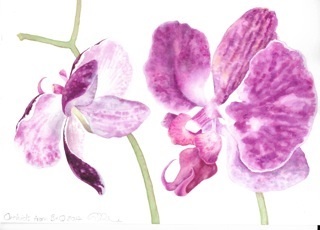 I especially love watercolours and have recently started teaching botanical art. Please see details of courses for 2014 on Courses Page of this website.